Byron has traced the gang leader. IMP Two-Reel Drama. Written by Harry B. Hangenah. Produced by John McDermott. The story of a young wife who mistakes imitation affection for the real. Fanchette, Mrs. Rayburg, whose husband is district attorney and a very busy man, cannot understand his seeming neglect and accepts the attentions of Mr. Rhodes. The city has been overrun by a band of clever crooks and Mr. Byron, head of the detective bureau, and Mr. Rayburg have many conferences on the subject. Byron reports that his men are closing in upon the gang leaders and hope to apprehend them within a short time. Mrs. Rayburg is angry because her husband will not take her to tea when she asks him, and in a fit of pique tells Rhodes that she will elope with him, promising to meet him at the apartment house where he lives. On this very night, Rayburg invites Byron and some friends home for dinner. 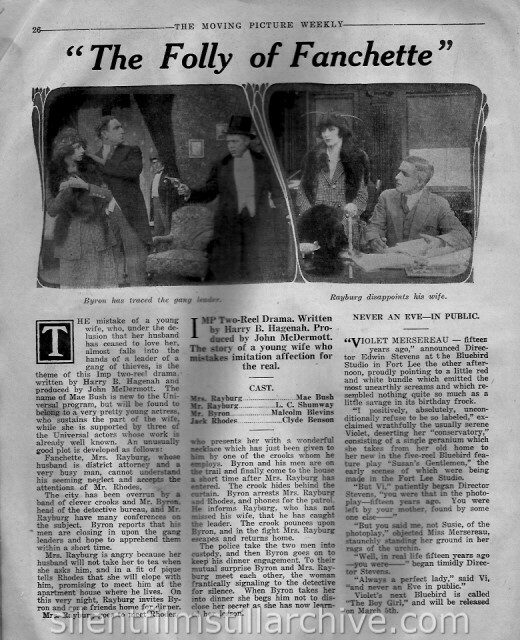 Mrs. Rayburg goes to meet Rhodes, who presents her with a wonderful necklace which has just been given to him by one of the crooks whom he employs. Byron and his men are on the trail and finally come to the house a short time after Mrs. Rayburg has entered. The crook hides behind the curtain. Byron arrests Mrs. Rayburg and Rhodes, and phones for the patrol. He informs Rayburg, who has not missed his wife, that he has caught the leader. The crook pounces upon Byron, and in the fight Mrs. Rayburg escapes and returns home. The police take the two men into custody, and then Byron goes on to keep his dinner engagement. To their mutual surprise Byron and Mrs. Rayberg meet each other, the woman frantically signaling the detective for silence. When Byron takes her into dinner she begs him not to disclose her secret as she has now learned her lesson. with Mae Busch, Lee Shumway , and Malcolm Blevins. Directed by John McDermott. IMP/Universal. Last Modified April 11, 2008.